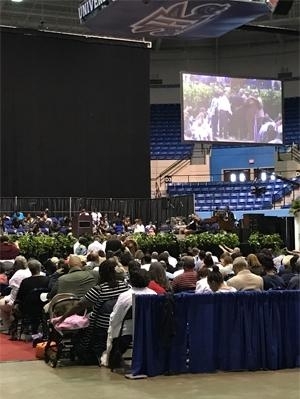 HAMPTON, Va. (July 29, 2018) — The African Methodist Episcopal Church (AME) held its second annual conference on Hampton University’s campus during the week of July 16-19, 2018. Each year, the conference fashions a theme of uplift, unity and continuous improvement and this year sought to close the gap in understanding between younger and older generations. “Hampton University is honored to have the AME Conference on our beautiful campus and we hope their time spent here is peaceful, enlightening and powerful,” said Hampton University President Dr. William R. Harvey. The AME Conference was founded in 1914 and sought to strengthen the skills and insights of ministers, and to support personnel to empower successful leadership across the country. This established a reputation attracting the best lecturers, scholarship models and practices for decades. Over the years, there have been a variety of speakers join this conference to help motivate and inspire those in attendance. When participants leave after the conference, the hope is that they will have gained the tools and abilities to educate others with information concerning scriptures and empowering others to be successful. This year’s theme, “Christ Centered Principles 4 Purposeful Change,” featured four principles that were split up into four years: Restoring Hope – Year 1, Empowering the People – Year 2, Advancing the Kingdom – Year 3, and Leaving a Legacy – Year 4. Throughout the week, attendants were split into groups, based on age, and were able to discuss and learn about the scriptures to ensure they were able to understand them and spread the knowledge to their respective parishioners.